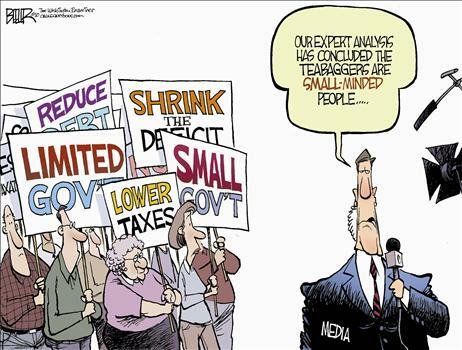 Democrats and the mainstream media have decided to make a Strawman of the Tea Party. Targeting The Tea Party is a bad choice for Democratic leaders and the Mainstream Media to haven chosen as a whipping post, or a target for slander. Democrats despicable name calling and bullying will not rescue the Democrats in the 2012 elections. Foolishly Democrats have taken on a massive active well informed voter block of Constitutional supporting traditional Americans who want the Federal Government to live within it's means. 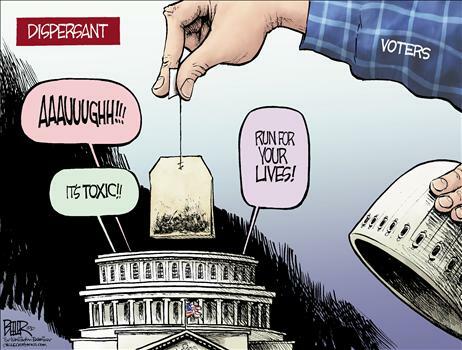 There is no titular head or main spokesperson of the Tea Party. The Tea Party is populated by millions and millions of focused active voters who are actively working to vette candidates, clean up voter rolls, register voters, and are willing to participate in Money Bombs, donating money in small amounts to candidates who share the ideals of limited government founded in the Constitution. Democrats and the Mainstream Media, Pundits on the left and Hollywood have chosen to vilify a group of Americans who are estimated to be in a Weekly Standard article, an estimated 58 million strong. 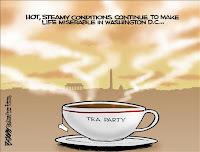 Jay Cost says, "While there are Tea Party meet-ups, marches onWashington, and even groups claiming to speak for the Tea Party as a whole (including a congressional caucus), it is nevertheless hard to think of the Tea Party as a literal party. After all, the actual number of people affiliated with any of these activities is a pittance compared to the 25 percent or so of American adults who consider themselves “Tea Partiers.” We’re talking about roughly 58 million people nationwide, more than the number who voted for Ronald Reagan in 1984." Tea Party Activist insist on reigning in government spending, repealing Obama Care, lower taxes and reigning in massive job killing government regulation. Tea Party Activist insist that our government at every level enforce Immigration laws. If Democrats had been as smart as they claim to be, they would have accepted Paul Ryan's Budget, Cut Cap and Balance, which would have prevented the loss of theTriple AAA rating of the United States. John Kerry, in a disgusting appearance on national news has shown he supports this hateful divide and conquer mentality of the left, if the Tea Party had been the Communist Viet Cong he would have loved us, I recall his meetings in Paris with the Viet Cong during the Paris Peace talks with the North Vietnamese. I say to the Democrats, Pundits on the Left, and the Mainstream Media, thank you for your recruiting efforts that grow our ranks. Look at the Tea Party election results from 2010, and in the Wisconsin Recall Elections. If those of you on the left are foolish enough to think that hard working Americans who pay their taxes are not going to hand you and the Obama Administration, 22 Democratic Senators and countless Democratic Congressmen a colossal loss in the 2012 General Election you are more than foolish. American Citizens have had enough. We demand a smaller fiscally responsible Government. Democrats should fear our votes. We intend to use them. We are Coming (again), Can You hear us now? We would be honored if we could republish the rss feed of "Perfection Under a Red Umbrella" in our Tea Party category. Our readers need to read what American patriots like you have to say. Great article! 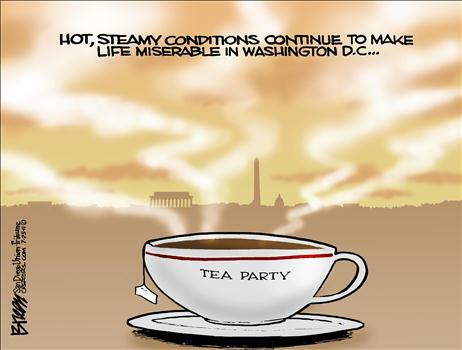 The Left is afraid of the tea party and it shows!